Who Is Responsible When a Malfunction Causes a Boating Accident? Being on water is one of the big draws of living and vacationing in Florida, and one of the more popular ways to experience this natural wonder is boating. Boating is often a family experience, and offers a lot of options for everyone to enjoy. However, it is easy to forget that boating does have some similarities with driving a car, and malfunctions or unsafe behavior can lead to boating accidents. Unlike cars, boaters do not wear seatbelts, and when a collision occurs, the injuries are frequently serious as passengers are thrown into the air and/or water. Two boaters in the Panhandle were recently hospitalized after colliding with a buoy. The cause of the accident was unknown, but boating operators are not vetted for their ability to safely and properly drive boats like drivers are when they apply for a license, so operator error is always a concern. Consequently, due attention and caution should be used to reduce the likelihood of an accident, though it is not always possible to compensate for another operator’s negligent behavior. Thus, many lawsuits for injuries related to boating accidents are based upon claims the defendant was negligent, but another issue that could lead to an accident and potential liability is if there was a malfunction or defect in the boat itself. In this situation, the manufacturer and/or seller could be legally responsible for any harm that resulted. 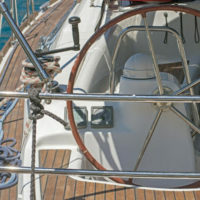 When a boat does not operate properly due to an inherent flaw in the design, the manufacturer can be responsible if injuries occur under a legal theory called product liability. Product liability lawsuits are based upon the premise that manufacturers have a responsibility to design and test their products for safety and correct function before releasing them into the marketplace. Products that contain a defect in the design that render them unreasonably dangerous even if used as intended exposes the manufacturer to potential liability and the payment of compensation to the victims. Proving product liability lawsuits can be easier than negligence claims if the case is presented as a strict liability case, because strict liability means the manufacturer did not have to be negligent, only that it produced a defective product. The focus in many defective design cases is whether the manufacturer knew or should have known of the risk. Issues with defective designs in the boating industry were recently investigated by a news outlet in Washington, D.C., and found insufficient testing of boat safety in the industry generally, and especially following design changes. Further, there appears to be a lack of government oversight of vessel safety and design, unlike the extensive regulation of the auto industry. Another type of product liability claim that could arise out of a malfunction is defective assembly of the vessel. This claim is used when there was an issue with the incorrect assembly of a product at the assembly plant. Unlike design defects, this is not a defect that would be present in all products, just those that were improperly put together. Essentially, a manufacturing defect occurs when the product cannot be safely used because of mistake in construction. These cases are brought against the entity that assembled a particular product or part, and typically require eliminating all other causes of an accident to find the factory responsible. This can be difficult to prove, and an attorney with experience in product liability cases should be consulted to determine the best course of action following an injury. Spending the day on the water should not end with a trip to the hospital. If you were injured in a boating accident due to another person’s negligence, or from a malfunctioning boat, contact an attorney that handles boating accident cases. The Miami law firm of Pita Weber Del Prado has experience filing both personal injury and product liability lawsuits, and can pursue all parties potentially responsible for your injuries. Contact us for a free consultation.